The US was perhaps the first country to become famous for its skyscrapers. When you picture New York, you picture a skyline dominated by towering glass-and-concrete structures. However, the US Agriculture Department (USDA) is trying to usher in a new generation of skyscrapers that could look very different from their predecessors. The White House is spending $2 million promoting the possibility of building them out of wood. The idea of a wooden skyscraper is no passing suggestion from a White House eccentric. A lot of investment is going into promoting the idea. 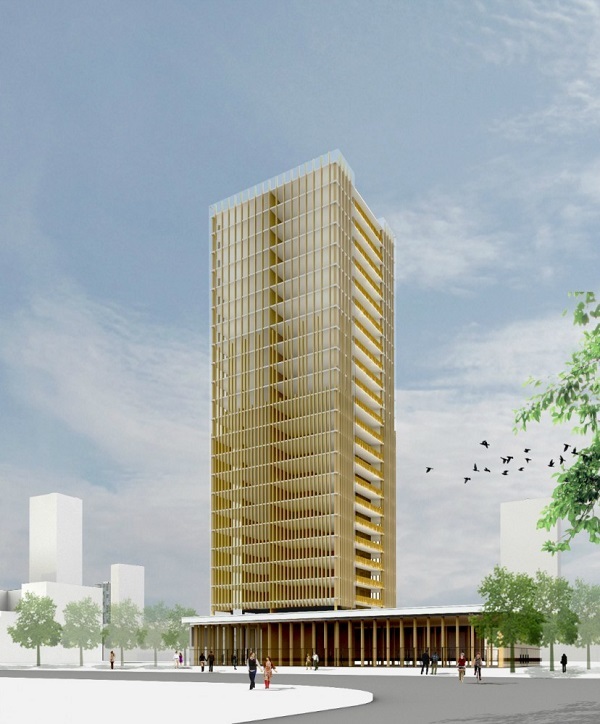 $1 million is going into promotional activities aimed at pushing the idea of wood as a material for such tall buildings, and a further $1 million is being invested in a competition to demonstrate the viability of such projects. There are two key reasons behind the push for wooden skyscrapers. Firstly, the White House is touting wood as a “green” material for building projects. They are emphasising the way in which its use will cut the amount of greenhouse gases produced by the construction of new developments. Secondly, they are hoping that the use of wood for large-scale construction projects would boost rural economies in America, meaning good news for those producing the wood and job creation for citizens in rural areas. If wooden skyscrapers take off, the UK will have some catching up to do in terms of using wood as a building material. Here, timber buildings are very much a niche option. Outside of sheds, garages and other outbuildings, the use of wood as a building material is almost entirely limited to individuals who are building their own home and want it to have both character and eco credentials. However, it might not be a matter of catching up so much as a case of two separate yet equivalent ideas. In the UK, straw is being increasingly used as a building material. As with wood, it is environmentally friendly, affordable, and provides a boost for rural economies. It has even been used in council building projects in places such as Lincolnshire. Until now, the construction industry and the manufacture of wooden pallets have had little to do with one another. However, the introduction of wooden skyscrapers could impact significantly on the pallet industry. When building a skyscraper, developers would likely want to source wood that is cheap, strong, lightweight and durable. In other words, wooden skyscrapers are likely to seek out wood with exactly the same properties as those used in pallets. This could see the wood used for pallets becoming less abundant and more expensive. This in turn could lead to an increase in the price of wood pallets for sale to consumers. It is possible that the popularity of pallets made from other materials such as plastic may increase as a result. However, whether this happens – and the extent of it – depends on whether production of suitable wood can meet the increased demand. It may be that it simply strengthens the companies supplying wood for the pallet industry, which would undoubtedly be good news.